Tomorrow is Grandparent's Day at school so my mother (aka Nana) will be attending a luncheon, art fair, and special musical performance just for the grandparents! Little Miss has been looking forward to it all week! They did the performance for parents tonight. Thus my later than normal posting - we just got home a bit ago. So I quickly made lunches and am trying to get things settled for the evening. 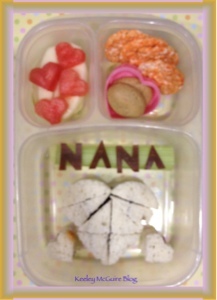 I wanted to do her special "Nana Lunch" more justice but getting home so late simply put a damper on more "cuteness". Oh well, I know she'll still love it! In her EasyLunchBoxes container, Little Miss has a SunButter & grape jelly sandwich cut out into bite size heart shapes using our FunBites LuvIt! cutter. Her bread is Udi's brand, which is gluten, nut, dairy, & soy free. Two celery sticks are underneath the word "NANA" I cut out by hand from an all-natural fruit leather. Top left are freshly cut pear slices with little watermelon hearts ontop. Top right are Happy Munchies carrot, gluten & nut free, rice cakes. Inside the little heart container (heart lid not pictured) are two HomeFree mini cookies. Awww! Giving Nana some love is awesome! Sounds like Little Miss will have a really fun day with her Nana! What a fun lunch! I think it's full of plenty of cute :D Hope they have a fun time together!